If you are the Trustee, Executor or the Personal Representative of an individual who dies because of someone’s carelessness or intentional actions, it is within your rights and responsibilities to help all affected recover from this terrible situation. Holding the responsible person or company responsible is a very effective way to improve the situation. 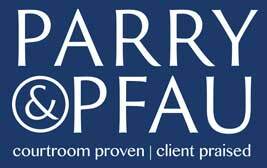 The experienced and award winning attorneys at Parry & Pfau can advise you of your legal options and guide you toward the path of recovery. When you sue for wrongful death, you are asking the court to make the situation better. The court then looks for the best method to help those that were left behind. This means of help is almost always in the form of money (otherwise known as damages). Loss of the deceased person’s love, care, support, protection, assistance, comfort, affection and moral support. Loss of the financial support that would have been received. Loss of a romantic companionship for the decedent’s spouse. If you find yourself in a situation where you have lost a loved one or you have the legal responsibility to file for wrongful death in Las Vegas, you should contact an attorney right away. A wrongful death action will preserve the rightful value of the estate so that beneficiaries can receive their proper share. These types of legal claims are also important in giving a sense of closure to the surviving family members who are experiencing a terrible and needless loss. If you are a Trustee, Executor or family member of someone who dies needlessly because of the actions of another person or company, please call the law offices of Parry & Pfau for help. We would will help you get the help you rightfully deserve.